A fan wrapped in a Brazilian flag travels on the subway to Spartak Stadium. 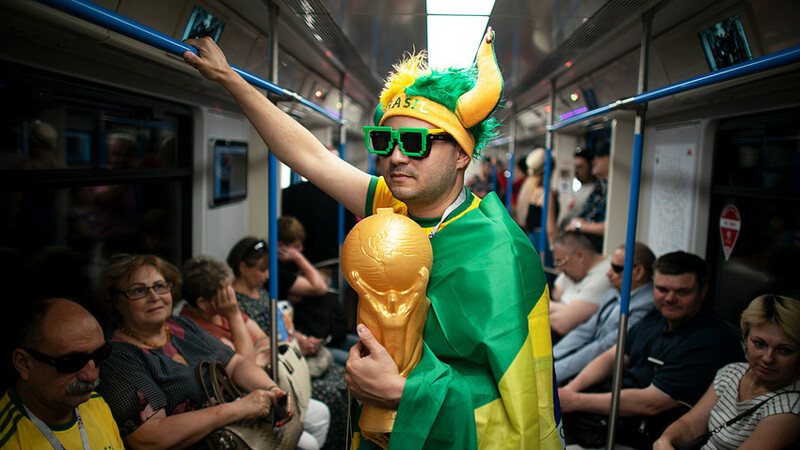 We’ve spoken to football fans about the subway, the organization and the soul of the World Cup. Here’s what they had to say about their Russian FIFA experience. Red Square is flooded with tourists, wrapped in colorful flags, with painted happy faces, the chimes interrupt the cheerful multilingual chatter. А crowd gathers around the Brazilian fans: they play their national drums and take pictures. Marie is from Paris. She studies in Canada and is about to continue in Saint-Petersburg. 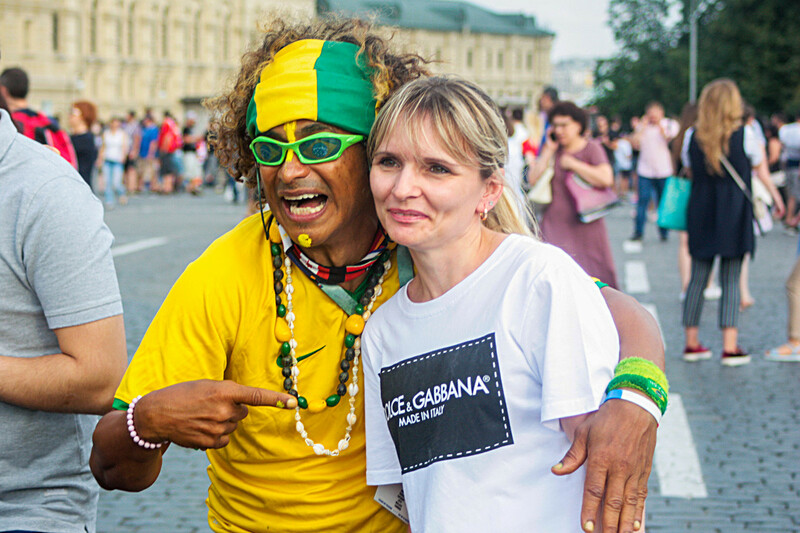 She is visiting the World Cup to experience the country beforehand. “The media tells us absolutely different things - that Russia is cold and unfriendly, that people are totally controlled by the government... that Russia is benighted and rusty - but everything is so different! I never expected that it would be so easy to see the games. Even if I didn’t have a ticket and didn’t want to go to the fan-zone. I could see the broadcasts on every screen, even in the subway”. One of the main difficulties associated with being in Russia is language. A lot of football fans we’ve been talking to told us that nobody speaks English, and it’s hard to find your bearings, even though there actually are lots of signs in the language. Claudia, also from Tunisia, carries a flag. Behind her, Saint Basil’s Cathedral. The fans unanimously say one thing: "Language is the main difficulty. In this beautiful country nobody speaks English". She also adds that organizers failed a bit with the signs, which she claims there aren’t enough of. A Spanish family of four talks about their time being the first, but definitely not the last, despite similar issues. “It’s all been very easy. If we seem lost, people always help us out. And the FIFA volunteers also are always there for the tourists. We were really surprised with the level of hospitality — locals don’t speak English, but it doesn’t make communication or staying here impossible”. Amal, glancing at her husband, says, "the only thing I couldn’t understand is that toilets are mixed wherever we go and men and women have to go to the same place. We’ve been to many cities of the world, but it’s the first time we see something like that. For us it was some kind of a cultural shock". (In actuality, those mixed toilets are movable WCs, which have been specially installed for the mass events. It is not common practice and one can easily find separated ladies’ and men’s facilities around town – ed.). The cities did their best to make the complicated system of subways understandable and clear for new arrivals. Turns out it was not enough. One respondent surprised us with his attitude to the non-English content of the signs: "I always just took subway and that is not a problem. The [cyrillic] letters here are different but… I can understand it now." Others, however, complained that sign translations are not a common sight - some bits remain difficult to understand due to the lack of an English version. “It all was very easy, especially as the public transport was free, we can just use our fan IDs everywhere. Russia appeared to be very friendly. The fan IDs worked even in museums. It’s such a great opportunity - we came here for the games and we got the full cultural agenda”, one passerby from the UK told us. The most expressive respondents were the Brazilians. Walles is one of the more bizarre fans, who really brought the carnival spirit with him. He literally glows with happiness and enthusiasm: "I’m gonna tell my friends in Brazil that they are missing the best time of their lives. People here are so warm, so open-hearted, welcoming... when I arrived I couldn’t stop smiling: sights, people, pictures, this and that... I think that this is the ideal world because it brings people together. I don’t know what is the energy that makes so many people adore the Russian World Cup, but it’s working very well. The energy that I felt here is the same as if I was home. I feel myself home here. I’m in paradise! Check out how else football fans partied during the World Cup.